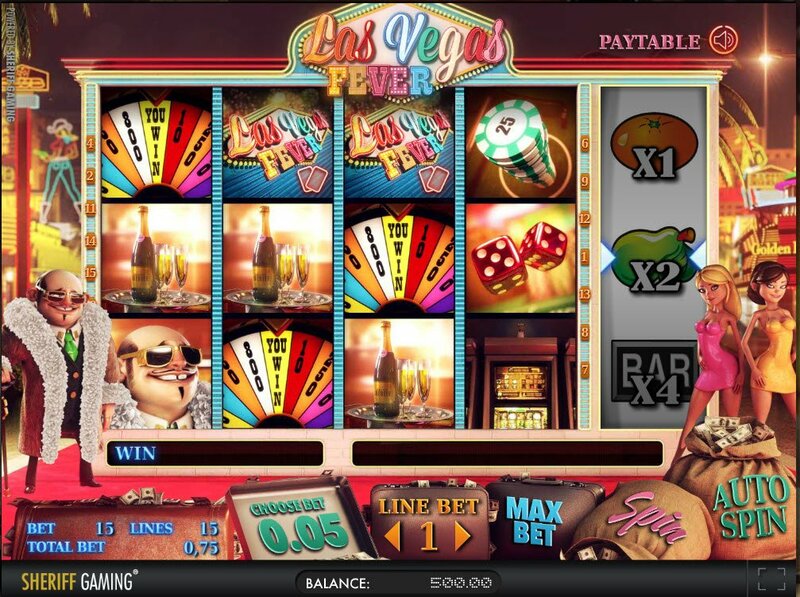 After that exhilarating introduction, we are whisked straight into the heart of Sheriff Gaming's Las Vegas Fever casino slot. The music is funky and accompanies you the whole way through your fever, along with the real life sounds of an actual Vegas casino. The images are iconic, of babes in beautiful dresses, dolled up for a night out on the tiles, while the slot machines pay out in a feverish rush of coins. The Vegas daddy, an iconic figure of Las Vegas, stands welcoming his girls, resplendent in a three quarter length furry coat, made from some poor losing lambs and sunglasses, indoors and at night. 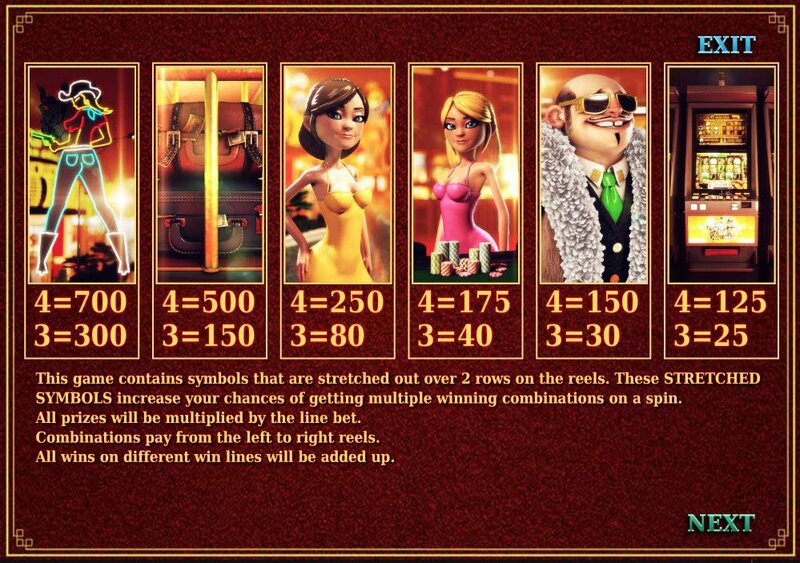 The stretched symbols in this Las Vegas Fever slot cover 2 reels and increase your chances of winning. Daddy Vegas and his bevvy of lovely ladies, plus the iconic cowgirl made out of Vegas lights and not forgetting an actual slot machine make up these stretchy winning symbols. The music is funky and accompanies you the whole way through your fever, along with the real life sounds of an actual Vegas casino. The roulette wheel, dice, a stack of chips, several stacks of chips waiting patiently in a roulette wheels betting space and a bottle of bubbly complete with glasses are some more symbols, paying out up to 100 coins. 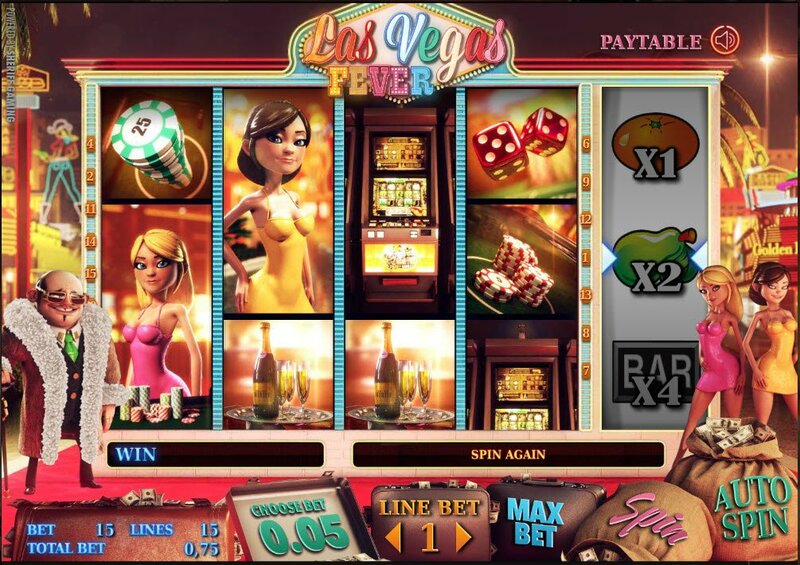 There's a Las Vegas Fever slot bonus Multiplier Reel, coming into play only after a winning reel or two on the normal slots. Full of the fruitful symbols of Vegas, a mystery prize and a bonus, you'll get either a 10x multiplier for all paylines triggered by the initial spin, or the Double Wheel of Fortune, which will throw prizes at you from all over the place. Don't forget the hot Click Me Bonus, where you will have a chance to beat the dealer.